How Your Fingers Detect Heart Attack Risk Years Ahead! One of the problems with heart health is that once the problem appears, it takes a great deal of effort to reverse it. Sometimes undergoing surgery or taking dangerous medications for a while are the only options at that point. But how about if you could detect heart attack risk 10 – 20 years before any obvious symptoms appear? This would give you plenty of time to make minor, positive changes to prevent the big bang. A new, completely un-invasive test does just that. You don’t even have to have your blood or urine taken. All it takes is looking at your fingers. According to Dr. Chris Renna, a physician at Lifespan Medicine, which is based in Santa Monica, the new and innovative test that can detect heart attack risk lies in endothelial functioning. The EndoPat test determines the health of the blood vessels, which plays a big role in healthy cardio functioning. Renna states that it is possible to determine the level of functioning of the endothelial cells in people as young as 30, and if dysfunction is present, correcting it as soon as possible is one way to improve their health later on in life. Some people are now choosing to use this test as an indicator of their cardio health levels, and whether they are doing enough to remain healthy in the future, especially when they reach 50 and above. Those undergoing the EndoPat test are hooked to sensors that are placed on each of their fingers. After the sensors are in place, blood pressure cuffs are used to stop the blood flow in one of the hands. When the cuff is deflated, the manner in which the blood flow recovers is measured by the sensors. In patients that are healthy, the blood flow will be prevented by the inflation of the cuff, but when it is deflated, the blood flow spikes for a while, to make up for the lack of blood, before it returns to normal. Those that display signs of abnormal heart functioning will only recover to the point that the blood flow was at before the cuff was inflated and the blood flow was stopped. There is no spike. If a patient’s test is abnormal, it’s likely they will end up experiencing problems with their heart later on in life. The good news is that this test allows them the chance to take preventative action so that their worst fears aren’t realized. Dr. Renna has stated that lifestyle modifications are some of the best ways to become heart healthy and prevent heart disease from becoming a reality. Some of the modifications that a person can make include exercising, watching your weight and eating a healthy diet. When combined, these changes contribute to the restoration of optimal functioning of the blood vessels, as well as the prevention of strokes and heart attacks. High blood pressure is the major cause of heart attack and stroke. Many people have this mistaken belief that it is easy to detect heart attack – pain in the chest, left arm and jaw, and all the sweaty drama that goes with it like we see on TV. …but the reality is, heart attacks are much more subtle! It is estimated that as many as 1 in 4 heart attacks are considered “silent,” meaning they appear out of the blue, with no clear warning signs preceding the event. 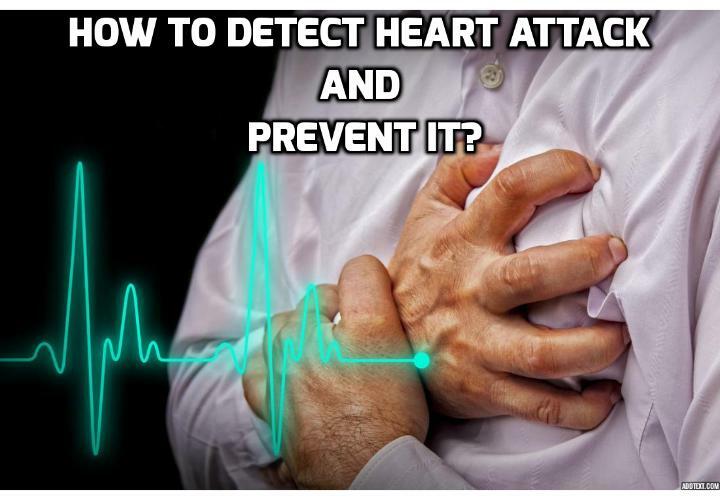 However, researchers are finding that there actually ARE signs that can help you to detect heart attack; we just aren’t seeing them and/or reacting to them. That’s why today we will look at the 4 signs to detect heart attack which you must pay attention- even if you don’t smoke, have heart disease, or any other at-risk disease- to know if your heart is about to go off. Heart disease kills more men and women every year than most cancers. It has been found in people as young as 9 years old, especially if there are other conditions like diabetes, obesity, or exposure to second-hand smoke. – Nausea and vomiting – if you are going about your day, feeling generally well and suddenly you start vomiting – and can’t tie it to something you ate – it’s time to take notice. Make a note of how many times you vomit and if there is pain preceding bouts of it, and if so, where. – Sweating profusely, or even just noticeably – when you normally don’t. People usually do sweat some when they vomit, or when they experience pain. But if you have pain, nausea, and sweating all lumped together, get to the doctor immediately. – Shortness of breath – most people will find shortness of breath accompanying strenuous workouts. They will also sometimes experience a little dizziness. But if you haven’t been working out, or sitting down and cooling off offers no relief, go to the ER. Shortness of breath is one symptom ER staff is extremely sensitive to, as it typically harkens very bad events about to happen. If it hurts to inhale or exhale, or you feel as if you are breathing through a straw, it’s time to get help. Many times, a general feeling of malaise or lethargy can happen for days or even weeks leading up to a heart attack, so if you have been feeling under the weather and these other symptoms start to appear, take notice. This post is from the High Blood Pressure Exercise Program. It was made by Christian Goodman Blue Heron health news that has been recognized as one of the top quality national health information websites. This program will provide you the natural high blood pressure treatments, natural recipes to cook healthy meals and useful strategies to build a healthy diet with the aim to help you to maintain and stabilize your blood pressure. What Can Terribly Happen if You Slept Less than 6 Hours? Can This Controversial Diet Drop Your Blood Pressure a Lot? How to Regulate Blood Pressure and Boost Health? Previous PostPrevious Can This Controversial Diet Drop Your Blood Pressure a Lot?